You’d think that it would be easy to preach on Christmas. After all, the Church does a lot of things very well, but we don’t do anything better than we do Christmas. On this day we do all the things that people expect from the Church. We have bells, and incense, and lots of candles. We have special music and larger crowds than on any other day of the year. If a stranger would walk in here today he or she would know that something pretty special is going on. The homily should be a piece of cake. But one thing you have to realize is that we really have three different groups of people here today. One, we have our “regulars”. You’re the people who come to Saint John’s week after week. You know me. Hopefully you know where I stand on things. You’re the ones that are easy to talk to. Second, we have family and friends who normally attend mass at another church but you come here on Christmas because of your family tradition, because you consider this a special, holy place. For you my task is to make you glad you came and maybe to convince you to come back more often. That’s a little bit more of a challenge. Then there’s the third group, the 600 pound gorilla that no one wants to talk about. You’re the ones who only come to mass once or twice a year. Hopefully I can give you a message that makes you want to kick your Catholicism up a notch; to become more active in your faith. You know, when you live in “church world” like I do, it’s very easy to get caught up in theology. It’s also tempting to show off what I know about the technical parts of the faith. But on this day, when we celebrate the birth of our Savior, you don’t want to hear that stuff. After all, God didn’t send us a scholar, or a theologian, or a liturgist, He sent us His Son. He sent Jesus to be born as an ordinary human infant in the poorest of circumstances. When He began His public ministry, Jesus’ message was simplicity itself. “Love God. Love your neighbor. Do what I tell you and you will be saved.” He left the details up to us. He didn’t tell us to follow Him one day a year. He calls us to share the joy of Christmas every single day. At Christmas time we’re bombarded with requests for help. It seems like the phone at home never stops ringing. The local paper reminds us every day of the “100 neediest cases.” There are bell ringers everywhere. That’s because charitable organizations know that we’re more generous this time of year. But Jesus doesn’t call us to love our neighbor every December. He calls us to love our neighbor every single day of the year. It’s not easy. We live in a very secular world and frankly, that world is a mess. Here in Saint Louis, we’ve just had another officer-involved shooting and more protests, even on Christmas eve. In just a few short months, the tiny town of Ferguson has become a household word, not just locally, but around the world. Other words in the news, North Korea, Cuba, Afghanistan all remind us of how unstable our world really is. Yet here we are, in this church in South Saint Louis, joining with millions of Christians around the world, celebrating the birth on one little child, more than 2,000 years ago. That says a lot about us. In the midst of the greed-fest that the secular world has attached to this day, we’re taking time to remember the one who can save us from our sins. If there is ever going to be peace on earth, it begins here. As the prayer of Saint Francis says, “Let there be peace on earth and let it begin with me.” Our challenge is to take the feelings we associate with Christmas and keep them going every day. That’s what Christmas means to each of us. That’s how it should affect our lives. There has been a Catholic church on this corner of 11th and Lafayette for 160 years. Generations of people have sat where you’re sitting, coming together to worship and to praise God, not just on Christmas, but throughout the year. In it’s heyday, this church was the largest parish in the Archdiocese. But times have changed. Our lives are full of distractions and temptations. Many former parishioners have moved away. Today just one in three Catholics attend mass regularly. If you only attend Saint John’s on Christmas, and maybe Easter, you may think that the chapel is full like this every week. Sadly, if you come back in a few weeks, you’ll find that there are maybe 30 to 40 people at a mass. In this troubled world, it’s almost impossible to continue this “feeling of Christmas” without attending mass regularly. One of Christ’s greatest gifts to us is the gift of His Body and Blood. Many of us take great care of our bodies, some better than others. We visit the doctor. We take vitamins. We exercise. We try to watch what we eat. Most of us get annual flu shots. That’s just common sense. But how well do we care for our spiritual selves? The Eucharist is our spiritual vitamin. By ingesting the very Body and Blood of Jesus, we recharge our souls giving us the strength to resist temptation. You might say it’s a spiritual flu shot. Another way to strengthen our spiritual selves is through prayer. Catholics are known to be praying people. We learned the main Catholic prayers, the Our Father, the Hail Mary, and others when we were children. Here at Saint John’s we have a special devotion to the Infant of Prague. We pray to Him after every mass, as we will today. I’m convinced that these prayers to the Infant whose birth we celebrate today have sustained this community through many trials and tribulations. Blessed Father Cyril heard the Infant say that “if you pray to me, I’ll take care of you.” There are cards in the pews containing Father Cyril’s prayer. Normally we ask you to leave them, but today I’m inviting you to take one home with you and get into the habit of saying the prayer daily. I promise you won’t be disappointed in the results. To close, I’d like to go back to the original question, “How does the birth of Christ impact our daily lives?” God loves us so much that He sent His only Son to save us from ourselves. The Son left us with very simple instructions. “Love God. Love your neighbor.” How you demonstrate that love is up to you. It sounds simple, but in practice it can be very difficult. Face it, some of us aren’t very loveable. It’s easy to love those who love us. The hard part, the real challenge is to love those who don’t love us or maybe even hate us. That’s what Jesus did. If we love Him, can we do any less; not just today, but every day of the year? In our first reading today, the Lord gives Nathan a fairly long message to deliver to David. He makes David a series of promises ending with “your throne shall stand firm forever.” Remember, this is the same David who had one of his men killed so he could have the man’s wife for himself. David’s closet was full of skeletons. But here’s God telling him that he’s going to be a mighty king and that his kingdom will last forever. Even in David’s time, everybody knew that no kingdom could last forever. It’s still true today. But the Lord wasn’t talking about an earthly kingdom. I want to stop here for just a minute. When I was first in formation for the diaconate, about fifteen years ago, I went to a two-day workshop on the Gospel of Luke. The speaker was Father Eugene La Verdier, an expert of Luke’s Gospel and the Acts of the Apostles, which was also written by Luke. He spent the entire first morning talking to us about this Gospel passage. Obviously I can’t tell you everything he said, but the gist of it was this. Everything about Mary was small. She lived in a very small town, Nazareth which was part of a very small province called Galilee. To the people of Jesus’ time, Nazareth was kind of a back-water place, definitely not the kind of place that would give birth to the Messiah. What I’m suggesting to you is this. The Son of God was born of a woman; an unmarried woman from a small, insignificant place. The idea that she would give birth to Jesus Christ, the Son of the Living God was outrageous. But Mary was chosen by God. Jesus was the only person in history to have chosen His own mother. He didn’t choose someone wealthy. He didn’t choose someone powerful. He didn’t choose a queen. Any of those choices would have made it much easier for Him to perform His ministry. He chose Mary. He chose Mary to show you and me that with God anything is possible. He chose her to give us encouragement. If this lowly girl could be His mother, then you and I shouldn’t be afraid to tackle anything. He chose her to show us how we should respond to God’s call just as he chose David to be a mighty king in spite of his past sins. Time and again you have shown your generosity to others. Your response to our Christmas gift drive was outstanding. As you celebrate your own Christmas, take a moment to remember that some poor child is having a merrier Christmas because of your donated gifts. After mass today (tomorrow) we’ll decorate the church for Christmas. We’ll have more poinsettias than ever before thanks to the generosity of our members who donated to our flower fund. Our Christmas visitors will be very impressed. During the year you’ve helped with other collections for those less fortunate than we are. We may be a small community, but together we get things done. That’s what discipleship is all about. In the coming year, I hope that we can all work together to spread the Gospel to more people. There are plans in the works to build our attendance and to increase our revenue. Saint John Nepomuk Chapel has a special place in the hearts of people all over Saint Louis and throughout the nation and the world. We recently received a check from a lady from Florida, a non-Catholic lady by the way, who heard about our broken window and wanted to help. There’s a Czech organization in Cleveland that sends us a check every year for Christmas. We regularly have visitors from other cities who attend mass here. You may not be aware that we often give tours to out-of-town groups visiting Saint Louis. Today, December 26, is the feast of Saint Stephen. Stephen was one of the first deacons (Acts of the Apostles, Chapter 6). He is the patron saint of Catholic deacons. He was also the first martyr. You’re probably familiar with the song, “Good King Wenceslas“. “Good King Wenceslas looked down, on the feast of Stephen.” The song continues on to tell us that the King went out to help a poor man who was gathering firewood on the King’s property. Instead of running him off, the King went out and helped the man. That’s one of the reasons he was called “Good King Wenceslas”. There was another Czech King Wenceslas, but he was anything but good. It’s good to recall that the writer of the song thought it was important to mention that this happened on Stephen’s feast day. It’s also important to remember that the story took place on the day after Christmas. This is the homily I gave on Christmas Eve at Saint John Nepomuk Chapel. For those not familiar, Saint John’s is an historic church in South Saint Louis. The church was founded by Bohemian immigrants in the 19th Century. veselé Vánoce! ‘null-ig hun-a dit’! Merry Christmas! That’s Czech because of who you are, Irish because of who I am, and American because of who we all are. However you say it, I want to wish all of you the very Merriest Christmas ever. What a thrill it is to stand up here in front of such a large crowd. Imagine that once-upon-a-time the church was filled like this all the time. But, while the crowds here may not be as big as they once were, we’re still here and that’s a mighty blessing from God. Beginning next week, we’ll be celebrating our 160th anniversary of worshipping our God at the corner of Lafayette and 11th street. Frankly there are a lot of people who would have bet that we’d never make it, but here we are. Since 1854 we’ve survived the Civil War, two world wars, a tornado, urban flight, and two interstate highways. Generations of Bohemian immigrants built this church and today a melting pot of ethnic heritages, including an Irish deacon, are keeping it going. Obviously we have a lot of visitors here this evening and we thank you for being here. I know it’s an annual tradition for many of you to come home to Saint John Nepomuk to celebrate this greatest of all nights. Vitame Vas! Welcome! Please keep us in your prayers the other fifty-one weeks of the year. Of course, you’re welcome to come back any time. In fact, we have a lot of exciting things planned for 2014 and we hope you can join us again for some special celebrations. Christmas is a time when we all look back. We look back to that night 2,000 years ago when Mary and Joseph traveled to Bethlehem to give birth to a very special child; a child the angel promised Joseph who would save His people from their sins. Many of us look back and remember loved ones who have gone on to the next life. We can’t help but think about our parents and grand parents who were with us in Christmases past but who aren’t physically with us today. But we know, because of what that special Child promised us, that they’re with us in spirit and they live on in our memories. As a relative newcomer to Saint John’s, I often think about the thousands of members of our church family who have gone before us. Sometimes, when no one else is around, I like to come here and pray, and to think about all those people who built this chapel, not once, but twice. I think about the sacrifices they made so that they, and we, would have this beautiful place to worship. As Catholics we share in a two-fold mission. We want to get to heaven. That’s what Jesus wants for us. He wants us to be with Him for eternity. But our greatest mission isn’t just to get to heaven. Our greatest mission is to take others with us. We’re called to share our faith with others. Our predecessors here at Saint John’s did that by making sure we’d have a beautiful place to worship. Many of them gave everything they had. When the cyclone destroyed their church in 1896, many of them quit their jobs so they could give their time to rebuilding. And these weren’t wealthy people. But they had their priorities, and their first priority was to rebuild God’s house. Of course they did it for themselves, but they also did it for us. Let’s never forget that! If you’re visiting us this afternoon, I’ve placed index cards in each pew. Please take a moment to put your name, address, and email address on one of them and place it in the collection basket. We’ll put you on the mailing list to keep you up-to-date on our Jubilee events. You can help us keep the memories of those great people alive. In know, that’s a bit of a long infomercial, but let’s get down to business. We’re here tonight to celebrate the miraculous birth of our Lord and Savior. We all know the story. God came to earth to live as a man and to die for our sins so that we could be saved. Just think about that! He’s God. He created the universe. He had all the power and all the glory yet he chose to become one of us. What kind of God would do that? The answer is a God who is all about love. He created us, but He wasn’t one of us. He knew that the best way to reach us was to walk among us. He would come down from heaven to take us back with Him. But why did He think it was necessary to come as a tiny baby? Why did He have to humble Himself to be born in a stable, to live among us, then to die a horrible death at the hands of His enemies? He could have come on a golden chariot with an army of angels. He could have come in the glory that He deserved. After all, that’s what the Jewish people expected. That’s what they still expect. And they’re right! He will come in glory when He returns. But, as they say, God works in mysterious ways. In His wisdom He chose to be born of a woman just like you and me. We have free will. That’s part of the deal. He wants us to love Him because we want to, not because we have to. To paraphrase Father Thomas Merton, one of the great Catholic writers of the twentieth century, God never gives us the whole answer. If He did, we’d have no choice but to believe him. That would be the end of free will. He just gives us part of the answer, leaving us to fill in the blanks. We fill in those blanks with something called “faith”. Faith is when we believe in something that can’t be proven. For centuries philosophers have tried to “prove” the existence of God and failed. A + B = C is a human concept. It’s just math. But A plus something that we have to accept on faith equals C is a divine concept. Jesus was a miracle worker. Tonight we celebrate the miracle of His birth. He was born of a woman without the help of a human father. He continued to work miracles up to and including His rising from the dead. He still works miracles today. And so, we come together today, in this beautiful church to celebrate His birth. We listen to the music, we hear His words, and we thank Him for loving us enough to become one of us. Salvation isn’t just for the rich and famous. It’s for everyone, including you and me. Ironically, the days leading up to Christmas can be the most hectic and frustrating days of the year. We’re bombarded with commercials for stuff that we just have to have. We have cards to send, parties to go to, and a long to-do list of things that just have to be done. Hurry, hurry, hurry. Now, at least for one day, that’s all behind us. Silent night, holy night is more than just a song lyric. It’s what it’s all about. That’s my wish for you on this Christmas Eve. I pray that you’ll take time out to just sit quietly and listen to God. veselé Vánoce! ‘null-ig hun-a dit’! Merry Christmas! Today is the fourth Sunday of Advent. All the candles on the Advent wreath have been lit. Now, it’s time to take the wreath down and decorate the church for Christmas. Father and I will hang up the purple vestments until the first week of March when Lent will begin. For the past three weekends we’ve been hearing about John the Baptist and his ministry of preparing the way of the Lord. Remember Jesus called John the greatest man ever born of a woman. But He promised us that the least person in heaven would be greater even than John. We have hope because that includes you and me. But today the Gospel takes a different tone. There’s no mention of John. Today’s story is about Mary and Joseph. It’s a critical story because it gives us some insight into what these two people had to do to fulfill their part in salvation history. Now, Mary was engaged to Joseph. When Joseph realized that Mary was pregnant his first impulse was to “divorce her quietly.” Remember, things were much different in Mary and Joseph’s world than they are today. In our world unmarried mothers are not scorned. They’re not ashamed of their situation and some even brag about it. Famous people, especially members of the Hollywood crowd go on talk shows and talk openly about their pregnancies. They are proud of what they’ve done and don’t seem the least bit concerned about their sinfulness. But for about the first 1,900 years of the Christian era, being an unwed mom wasn’t something to be celebrated. It was the cause of great shame and embarrassment. So, it’s not hard to understand how Joseph felt. Mary had brought shame on herself and on him. Guys, put yourself in his place. What would you have done? Matthew tells us that Joseph was a “righteous man”. He was “unwilling to expose her to shame.” I don’t know about you, but I don’t think I would have been as gracious as Joseph. But the angel appears to him in a dream and explains what’s going on. Mary has conceived through the Holy Spirit. Her son will save His people from their sins. The experts tell us that Mary was young, probably a teenager. Joseph was older. Imagine what his friends and family must have said. “It serves your right, Joseph. You decide to marry this young girl and she turns up pregnant. What did you expect?” Think about the gossip. But, he ignored the taunts of his so-called friends and did what the angel told him to do. I’m sure he spent a lot of time in prayer. Joseph, being a “righteous man” and a devout Jew, surely was familiar with Isaiah’s prophesy. Surely he and Mary spent a lot of time talking about what was about to happen. Maybe they both had planned on having a big family. Maybe Joseph had big plans for his carpentry business. If they were engaged, they must have spent a lot of time talking about what their lives would be like as a married couple. But all that changed in an instant. And today we thank God that they were willing to give all that up for the greater glory of God. If either one of them had said no 2,000 years ago, our lives would be very different today. By agreeing to God’s plan they set things in motion that would change the world forever. You and I also play a part in God’s plan. Even though we will probably never be recognized by the world, every time we say yes to God’s plan, we start a chain-of-events that changes the world. Is there anyone here who’s never seen It’s a Wonderful Life? It was on TV last night. George Bailey was given a wonderful gift. He gets to see what his world would have been like if he’d never been born. Of course it’s fiction, but it’s definitely a story that should make us think. What would our world be like if we’d never been born? What little things have we done that have changed other people’s lives? Chances are, like George, we have no idea. God does great things through ordinary people and things. If you’ve been following the news this week, you know about Phil Robertson. He’s been attacked for stating his Christian beliefs. And the whole thing has had some remarkable results. There’s a Facebook page called “Bring Back Phil Robertson”. In just two days it’s received more than a million “likes”. Americans are standing up for their faith (and Phil’s) in amazing numbers. God is working a miracle with something as simple as a duck call. It’s a beautiful thing to happen just a week before Christmas. My recent blog post on Phil-gate has had more hits than all my previous posts put together. I could stand up here all day and talk about things that have happened in my life that can only be explained by God’s intervention. He put the right person in the right place at the right time to give me something that I needed. Maybe it was something they said. Maybe it was something they did. But, God’s hand was in it. I know all of you could do the same. So, as we prepare to celebrate the greatest event in the history of mankind, it’s good to reflect on today’s story. Two ordinary people from a very small town said yes to God and changed everything. That’s what Christmas is about. That’s what our Catholic faith is all about. Christmas is a time when we focus on a great miracle. But miracles happen every day. We may be the catalyst for a miracle and never even know it. Thank you Mary and Joseph for saying “yes”. Alright, it’s time for my annual rant. When are Christians, who happen to be a majority in the United States, going to stand up and defend the faith. Here we are, getting ready for the birth of Christ, you know, the guy who let Himself be crucified to save us from our sins. There has never been a greater sacrifice, yet we’re allowing non-Christians deny us our celebration of this greatest day. First, many of the largest retailers refuse to recognize Christmas, even though they have no problem selling us tons of stuff. 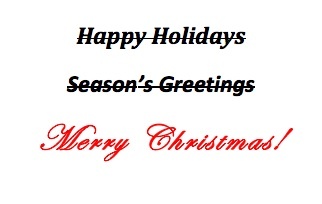 Signs and ads proclaim “Happy Holidays”, “Seasons Greetings” and other politically correct nonsense while refusing to wish us a Merry Christmas. Next we have the relatively new phenomenon of “Black Friday” creeping into Thanksgiving. Of course, the government has joined in the fun by refusing to allow Christmas displays on public property, though that’s been kind of hit-and-miss. Some places allow it. Some don’t. But the attack are getting more serious and at the same time more ridiculous. Here are just two examples posted by Tod Starnes of Fox News. Next, homeowners in Orange County, CA have been ordered to remove their outdoor Christmas lights. One community is known for their light displays and draw visitors from great distances, similar to “Candy Cane Lane“, here in Saint Louis. The county claims the lights are “an obstruction” and violate local ordinances. Give me a break! Abraham Lincoln once said that America wouldn’t be destroyed by outside forces, but from within. Complacency is our greatest enemy. Every little attack on our faith that goes unchallenged adds to the total religious persecution that we’re experiencing right here in the once God-fearing United States. We need to wake up! Don’t just accept anti-Christian persecution. Don’t say, “Oh, it’s just one school.” or “Hey, it’s just one neighborhood.” Speak up. When a store clerk says “happy holidays” smile and say, “Merry Christmas.” Maybe you don’t like to make a fuss. Maybe you don’t want to embarrass someone else (or yourself). Tell it to the Guy hanging on the cross. Here we are at the beginning of the 1st week of Advent. Once again, the secular media and the retail industry are trying to get us into the “holiday” spirit, which means we should spend, spend, spend. Don’t get me wrong. I spent most of my adult life in the retail and/or wholesale business. I understand the need for a company to make a profit. Millions of jobs depend on companies staying in business and it’s no secret that the month of December is make it or break it time for most companies in the consumer products businesses. In fact, the term “black Friday” (which I never did like) stems from the fact that most retailers (if they’re lucky) run at a break-even pace for the first eleven months of the year and only begin to make a profit (get “in the black”) on the day after Thanksgiving. It’s a bit of an oversimplification, but it’s often true. I have no problem with that. In fact, my annual bonus in my previous life depended on lots of people buying lots of stuff in the period between Thanksgiving and Christmas. But, here’s the thing. You and I, as faithful Catholics, are called to spend the four weeks of Advent preparing ourselves for the coming of the Savior of the world. It’s a time to pray and reflect on the meaning of Christ’s coming. Sometimes it’s hard to focus on this critically important day in the history of the world when we’re overwhelmed with ads, and sales, and special events. It’s just the 2nd Day of December and I’m already tired of all the hype. If I see one more luxury car with a big red bow on top I may throw my shoe through the TV screen. Enough! Father John Mayer was the celebrant at our 4:30 mass this past Saturday. In his homily he made an excellent suggestion. He was speaking of the evening news, but I would suggest you try this whenever you’re sitting in front of the television. When the commercials come on hit the mute button. There are 44 minutes of actual programming in the typical prime time hour. That means there are 16 minutes of commercials per hour. If you were to spend those sixteen minutes talking to or reflecting on God every hour that you’re in front of the TV, how much better a person might you be by December 25? How long does it take to pray the Rosary? About 15 minutes? How often are you praying the Rosary now? See what I mean? I know this blog isn’t going to change the world, but imagine how the world would change if every Catholic in America prayed the Rosary once each day instead of watching commercials, every single day. I’m just sayin’……. Why not give it a try. After all, you’ve probably heard all the commercials you really need to hear.